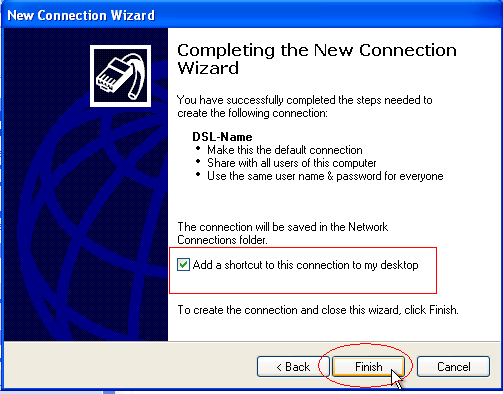 This tutorial is for anyone who wants to configure the PPPoE Windows XP connection. 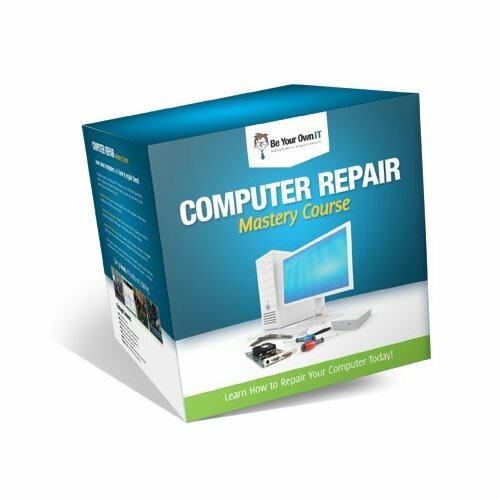 In some cases, your ISP would run a CAT5 or CAT5e cable from a device called the DMARC on the outside of your home to anywhere you desire in your house. Inside the home, the technician will install an Ethernet jack where it is ready for Internet connection. Usually your ISP will provide you with a DSL Modem which connects to a phone jack in your house. But in the rare case that they do install an Ethernet jack, you will have to configure your own computer or own router with the PPPoE connection settings that will establish the Internet connection with the ISP. 1.) 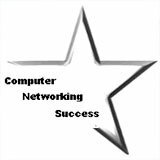 You can connect a switch to that jack that the Internet Service Provider (ISP) installed. Lets say the switch you install is 4 ports. 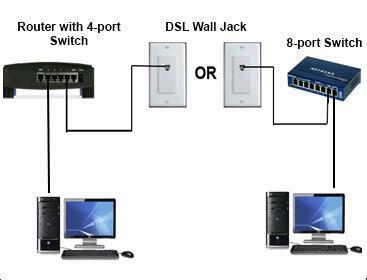 Then this means you would use a patch cable from the Ethernet wall jack and connect it to any of the switches ports. The other 3 ports are used for your computers or network devices. note: the Linksys router that I use in these tutorials has a 4 port built-in switch. 2.) 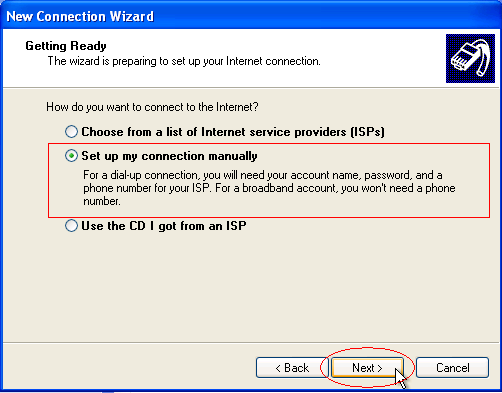 The second scenario would be to install your home router to the ISP Ethernet jack and configure your computer or router to initiate the PPPoE Windows XP connection. 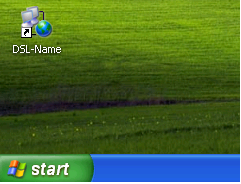 Lets start with the configuration of Windows XP to initiate the PPPoE connection. 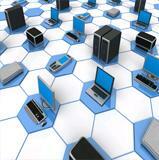 To configure your PPPoE on your home router click for that tutorial. 1.) Click "Start" then "Settings" then click "Network Connections". 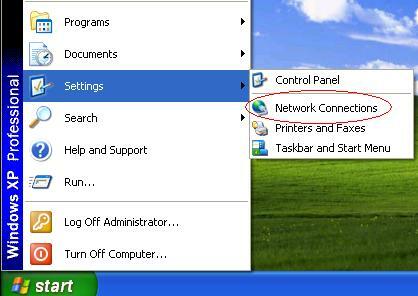 Another way to get to "network connections" if you don't see it would be to click "Start" then "Settings" and then "Control Panel". The control panel screen shows up and then you can search for "Network Connections" and double-click it. 2.) 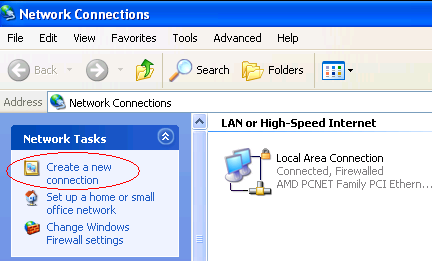 Click "Create a new Connection" on the "Network Connections" window. 3.) 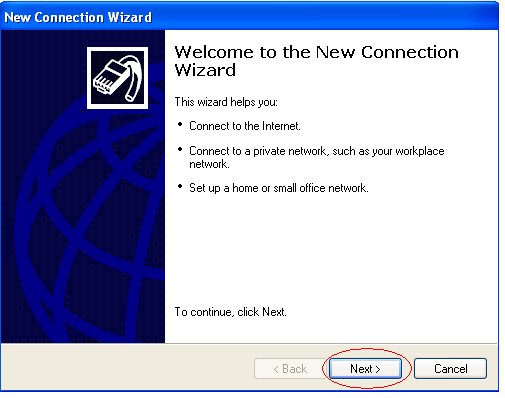 When the "Create a new connection" wizard opens, then click "Next". 4.) 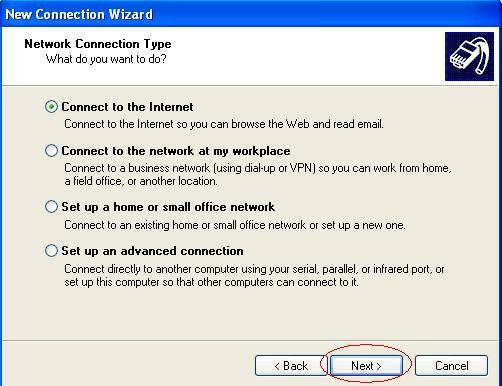 Make sure "Connect to the Internet" option is chosen and click "Next"
5.) Next select "Set up my connection manually" and click "Next"
6.) 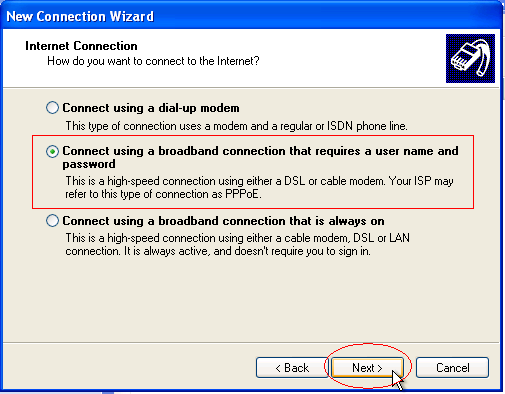 Select "Connect using a broadband connection that requires a user name and password" and click "Next"
The extra information under this option confirms that you are creating a PPPoE connection for your DSL. 7.) In this next window type in a name for your new PPPoE connection that you will be easy to recognize. 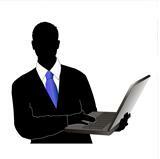 Click "Next"
8.) 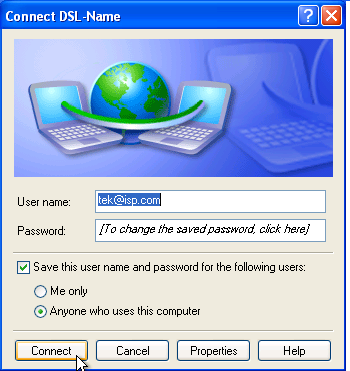 When you first subscribe to your ISP, they will provide you with a unique username and password for you to use to connect to the Internet. You should type that information in this window. If you have more than one user account on this computer and you want that user to use this connection, then leave the first option checked. The second option is to make this Internet Connection the default. (In case you have more than one PPPoE connection created). Leave it checked to make this new connection the default. 9.) Finally, make sure you have the "Add a shortcut to this connection to my desktop" checked to ensure that you can easily find it on your desktop and connect to the Internet. 10.) You can now find a new PPPoE icon on the "Network Connections" window and also on your desktop. 11.) Make sure your Ethernet adapter is set to "Obtain an IP address automatically". 1.) Go to "Start", "Network Connections", right-click "Local Area Connection" and click "Properties"
2.) 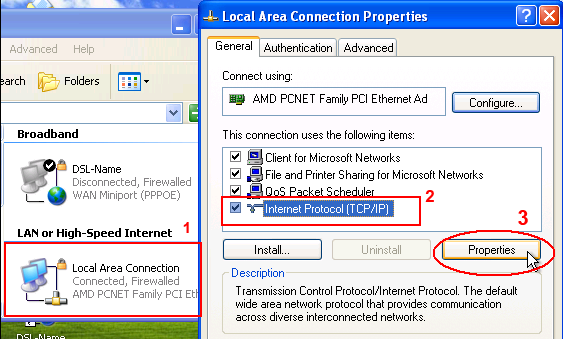 In the new window select "Internet Protocol (TCP/IP)" and click 3.) "Properties". 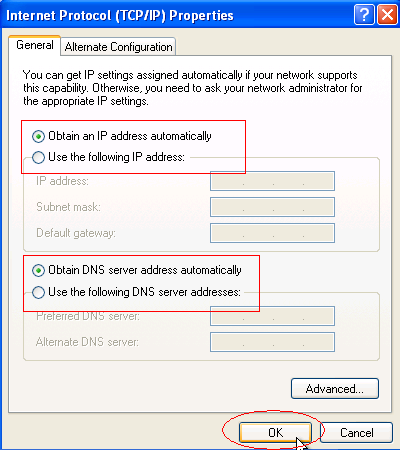 In the new window make sure "Obtain an IP address automatically" and "Obtain DNS server address automatically" are both selected and click "OK". When you start the new PPPoE connection in the next step, then your computer will grab the correct IP settings from your ISP. 12.) 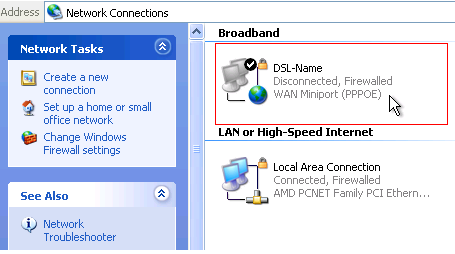 Double-click the icon for your new PPPoE connection called "DSL-Name" and click "Connect" and you're ready to surf the Net. 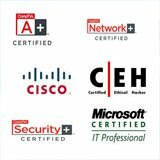 It is assumed that at this point your computer is connected to the Ethernet jack that your ISP installed.